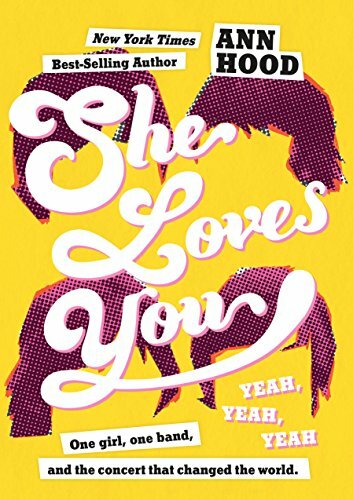 I don't often delve into middle grade books but I am a big Ann Hood fan and I was gifted with her latest book, She Loves You (Yeah, Yeah, Yeah), so I thought I'd give it a shot. Other than Hood's name on the cover of the book, I must admit to being completely the wrong audience for this novel. I am not even close to the right age (even my children are far past the age this is aimed at) for middle grade and I am not really a Beatles fan although I do know and appreciate their influence on the music that came after them. But I also know that Hood really knows how to write. Trudy Mixer (please don't call her Gertrude) is the President and Founder of the Beatles fan club at her junior high, the first fan club in the entire state of Rhode Island. A wildly popular club in elementary school, all of a sudden, its 24 member high has dwindled to 4, the smallest it can be before it is no longer officially a club. It's hard that the three remaining members besides Trudy are odd but the most hurtful thing about the whole thing is the defection of Trudy's best friend Michelle to the Future Cheerleaders Club and her subsequent abandonment of Trudy for more popular girls. When Trudy's father, a workaholic who shares an interest in the Beatles with his daughter but otherwise doesn't give her the attention she craves, gets four tickets to the Beatles concert in Boston, Trudy is certain that this will restore her relationship with Michelle. Even this magic seems to fail so Trudy declares that she is going to meet Paul (her favorite Beatle) and that meeting him will change everything. How one junior high girl is going to meet her idol when even getting to the concert becomes questionable drives the novel forward. Trudy's obsession with the Beatles allows her to rationalize her continued relationship with three unpopular kids. It is these three who stand together with Trudy, teaching her something about friendship, perseverance, and that her own problems aren't the only ones in the world. Hood uses the other club members to highlight several of the social issues of the 1960s and the impact they had on regular people: Vietnam and feminism, as well as love. While the book itself feels like a time capsule from 1966 given all of the exquisite time period details, Hood has also captured the universality of the pain and confusion and awfulness of navigating junior high, of trying to find yourself in an ever changing landscape of random popularity, never knowing entirely what will doom you to the devastating horror of being unpopular, what will lose you your long time best friend. The emotional upheaval and the magical thinking of junior high are absolutely spot on. The end to the book is both sweet and improbable but since you've long since started rooting for Trudy and company, it is forgivable. With Trudy as the narrator, the reader doesn't really learn much about the other three club members until quite late in the narrative when Trudy herself learns about them, looking beyond herself and becoming that little bit less absorbed in herself that allows her to open up to the idea of friendship with someone other than Michelle. A book about a Beatles obsessed 12 year old seems a little strange for today's middle schoolers but Hood's attention to detail and ability to draw the emotional reality of middle school might just make this more popular than I would expect.